Are Beliefs About God Genetic? As a believer in both God and Evolution, I often wonder about the role God might've had in evolution. But as one with a strong interest in psychology, I think an even more interesting question pertains to the role evolution might've had in human perceptions and beliefs about God. Is there a strong genetic component to belief (or non-belief) in God? And if so, what are the theological implications? Scientific studies, especially those of twins (comparing identical vs. fraternal, adopted and non-adopted), have concluded that 30-55% (depending on the study) of the variation in belief about God was heritable. Because there is a right and a wrong answer to the God question (i.e., God either exists or he doesn't), it follows that some people, although we don't know who, must have genetic advantages and disadvantages when it comes to correctly answering it. That has some interesting and unnerving implications. You might be fooling yourself if you think your lack of belief in God is rational. There's a distinct possibility that you're like a blind person who doesn't believe the moon exists because you can't see it, hear it, or feel it. Maybe you have an innate advantage of not sensing things that aren't there, or maybe you have an innate disadvantage in detecting certain things that are. Maybe you naturally have a difficult time processing evidence that isn't concrete. Or maybe your genetics make you naturally inclined toward theism, which might help explain why you sometimes feel like you're fighting against a natural urge to embrace the spiritual. You might be fooling yourself if you think your belief in God is rational. There's a distinct possibility that you're like a person with schizophrenia believing [non-existent] people are spying on you, because your hallucinations seem totally real. Maybe you have an innate advantage in detecting things that other people can't, or maybe you're wired to sense things that aren't actually there. Maybe you're naturally more gullible than others. Or maybe your genetics make you naturally inclined toward atheism, which might help explain why believing in God is an especially difficult struggle for you. Regardless of one's beliefs about God, recognizing a strong genetic component should humble us and make us even more careful not to be dismissive of theological views we don't share. Everyone experiences the world differently, and what may seem obvious to some might be nearly impossible for others to grasp. How do you know that, if you had someone else's genetic makeup, you wouldn't believe (or lack belief in) the same things as them? And how do you know that your genetic makeup isn't one that inhibits your ability to discern the truth about God? Those are difficult questions that I think all of us should consider very seriously. Fortunately, the other side of the coin is that the evidence reveals a similarly strong non-genetic component. Thus, everyone possesses the ability to believe or not believe in God, examine the evidence and arguments for themselves, and hopefully come to the right conclusion -- even if it might seem more difficult and unnatural for some of us. Whatever weakness we might have, it's probably also someone else's strength. We can take full advantage of that, whether it's by applying the Ensemble Model of Religion or just by humbly and receptively listening to other people, keeping in mind that the truth isn't necessarily in the same direction as our inclinations lead us. "We are all atheists about most of the gods that humanity has ever believed in. Some of us just go one god further.” That's the difference between atheists and theists, according to Richard Dawkins. The implication is that theists have a double-standard. They apply critical thinking and skepticism to the gods of other religions, but not to their own. If only they were consistent, they'd be atheists like him. The premise of his response is that there's no reason to believe in one god over another. Belief in a particular God is just an accident of upbringing. If one grew up in Classical Greece, they'd believe in Zeus. Viking-era Denmark, they'd believe in Thor, and so on. Believing in the God of the Torah is just as arbitrary as believing in the Flying Spaghetti Monster. Is he right? To answer that question, I'll go back through some of my previous posts and apply the same standards to the Flying Spaghetti Monster. Compared to the God of the Torah, the Flying Spaghetti Monster has very specific, knowable, observable characteristics. Thus, it'd have a relatively low “Prior Believability” score. If these two were the only options, the Spaghetti Monster would have a slightly lower prior probability, but more evidence would be needed in order to make a definitive choice. Some might disagree with my conclusions in #1, and I doubt I could prove them here. So instead of relying on that for a prior probability, I'll start with the Principle of Indifference. Until evidence is evaluated, I'll start by regarding the God of Abraham and the Flying Spaghetti Monster as equally probable. I'm not aware of any predictions made by written accounts about the Flying Spaghetti Monster. No evidence means no change from prior probability unless there is evidence for another mutually exclusive possibility. The verified Torah predictions move it slightly in favor of its God, which reduces the probability of the Spaghetti Monster. Maybe something like 60% for the God of the Torah and 40% for the Spaghetti Monster, if those are the only two options. I suspect that Bigfoot-believers might be more likely to believe in the Flying Spaghetti Monster than non-Bigfoot-believers are, but that probably isn't relevant here. The prophets of Israel made correct predictions that are more probable if their God exists than if he doesn't. The prophetic predictions are independent of the Torah's predictions used above, so they count as additional evidence. No such evidence exists for the Spaghetti Monster, at least not that I'm aware of. Now I'm closer to 70% for Israel's God and 30% for the Spaghetti Monster. There is a lot more data to consider, but it's futile. My above attempts at evaluating evidence also are futile, because the probabilities I assigned are [arguably] arbitrary and the strength of the evidence surely would be questioned by people who disagree. Thus, it'd be pointless to present evidence and give my evaluation of it. Fortunately, my most recent post provided a way to use everyone's evaluation of the evidence, giving mine no more weight than anyone else's. The ensemble model provides a very clear answer. In the absence of unambiguous evidence or relevant insight that others don't have, if humans have any skill at all in discerning such things, the most rational default position is that the God of Abraham probably is the true God and any other, including the Flying Spaghetti Monster, probably isn't. 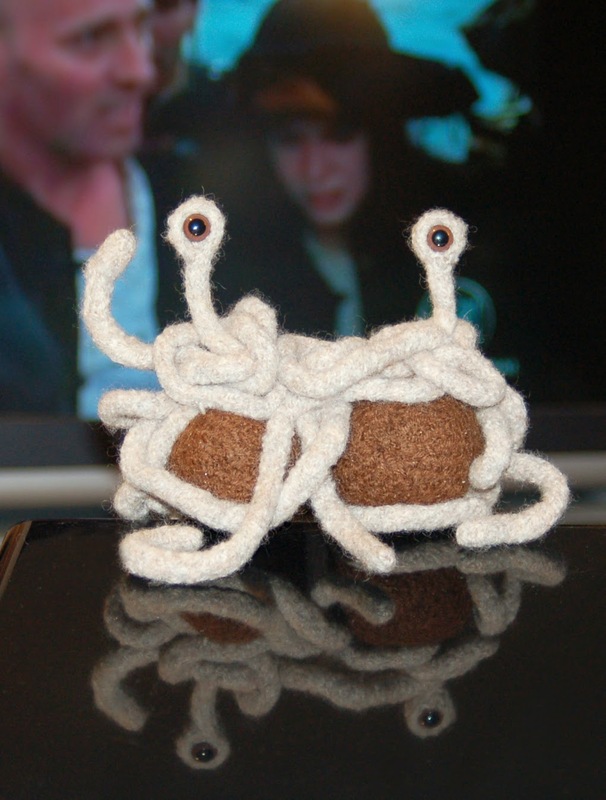 Virtually nobody who has evaluated the evidence believes in the Spaghetti Monster, which suggests that the evidence for it is very weak at best. That doesn't mean it doesn't exist. It's possible that everyone is wrong about it. But believing that would require very strong evidence, and we don't have it. If writings about the Spaghetti Monster gave accurate predictions of world-changing future events, I'd spend a lot more time studying them. And if millions of people examined the available data and concluded that it's real, I wouldn't necessarily believe in it, but I'd take it very seriously and would be very, very careful about calling it a "delusion" or saying there's "no evidence" for it. Until that happens, or I discover compelling new evidence for it, I probably won't be joining the Church of the Flying Spaghetti Monster, although I wouldn't mind visiting it some time. Religious beliefs are a lot like medium-range weather forecasts. They're our best educated guesses about things about which we don't know for sure and don't have much direct, indisputable evidence. The evidence we do have can be interpreted in a variety of ways. Rather than expecting to get everything perfectly right, the main goal of medium-range forecasts is to minimize the error. I think that's a good goal for religious beliefs too. And I think a similar method can help. The human mind is hopelessly biased, especially when it comes to religious beliefs. We have all kinds of [often subconscious] motivations that lead us believe what we want to believe. We think our beliefs are based on evidence and the beliefs we reject lack evidence. But our interpretations of the evidence are so infected by confirmation bias and other biases that we often come to opposite conclusions when evaluating the same evidence. Weather forecast models also have errors and biases. One of the best ways to minimize them is to use ensembles. Ensembles are collections of different forecasts based on slightly different initial conditions and/or model physics. They rely on the principle that the ensemble mean (i.e., the average of all forecast solutions) has, over a sufficiently long period of time, less error than any single ensemble member (i.e., an individual forecast). Biases of individual members tend to cancel each other out and their unique errors tend to be somewhat corrected by other members with different solutions. On any given day, a few of the members might be more accurate than the ensemble mean, but we seldom know which one will be the best until it's too late. So it is with religion. There's a wide variety of flawed, biased beliefs, many of which contradict each other. Some believe there is one God, some believe there are many Gods, and some believe there is no God. They can't all be right, but they all might have some insight that others don't have. Attempts to determine which beliefs are most accurate are inevitably contaminated by a plethora of cognitive biases. But we don't have to give up and adopt total agnosticism. Fortunately, in situations where the evidence is ambiguous and there are multiple conflicting answers, science gives us a reliable default solution: the ensemble mean. There probably is only one God. That God probably is the God of Abraham, as originally described in the Torah. God probably created animals and humans via the process of Evolution. There probably is some kind of life after death. There probably is something uniquely special about Jesus of Nazareth. Unique doctrines taught only by particular sects within Christianity, Islam, etc. probably aren't true. Extreme fundamentalism and extreme theological liberalism probably aren't the best interpretations of holy texts. This “ensemble mean”, based on global religious statistics, is consistent with beliefs that are largely based on biblical Judaism, influenced by Christianity, Islam, and (to a lesser extent) smaller religions, and contain a relatively small but still significant dose of secularism and atheist skepticism. To be clear, I'm NOT saying the majority is always right or that truth should be determined by popular vote. The majority has been wrong many times throughout history. The centrist position also has a long history of being wrong. As with ensemble forecast models, the mean tends to smooth out important details and minimize extremes that some members might be correct about. The point simply is that in the absence of compelling evidence, the ensemble mean is the best starting point. It's natural for humans to think there's strong evidence when there isn't, or vice-versa. It's also natural to think we have insight that other people with different beliefs don't have, perhaps because we're more intelligent, had more-relevant life experiences, or are more educated in science, philosophy, or religion. Though these may indeed be useful in evaluating certain verifiable beliefs, they don't provide consistent non-circular answers to fundamental questions such as “Is there a God?”. Much smarter, more experienced, more educated people than you or I have come to opposite conclusions about such questions. Another natural inclination is to believe other people's biases are stronger than our own – which itself is an especially pernicious bias known as the “bias blind spot”. It's easy to think of reasons why others' religious beliefs are biased – e.g., growing up in a particular religious environment, indoctrination, bad experiences with religious people, not wanting to accept that one's behavior is sinful, fear of death, etc. It's much harder to recognize biases in ourselves, some of which we're not even consciously aware of. Though I believe the “ensemble mean” of religious beliefs is the best starting point in the absence of compelling evidence, I don't think we're stuck there. As I think I've shown in previous posts, evidence does exist, and it should shift our position away from the mean. My beliefs deviate quite a bit from the mean sometimes [as anyone who knows me can attest]. But it's something that I think we should be very careful about. Deviating far from the ensemble mean requires strong evidence. It also requires a lot of faith in one's own ability to overcome cognitive biases. That ability, at least in my case, is inconsistent at best. Why do bad things to happen to good people? How could a loving God allow so much sadness and suffering? Why didn't God give us a better world? I've heard many "answers" to these questions. None of them are very compelling. They generally don't address what I believe to be the core issue: human perception. When it comes to human circumstances, our perception of "good" and "bad" is largely relative (note: this doesn't mean morality is relative). For example, rain is considered "good" during a drought but "bad" during a flood. An American at the poverty line would be considered "rich" in Liberia. Even universally bad things, such as the death of children, which truly is a tragedy, is only considered tragic because humans generally live longer and develop more. 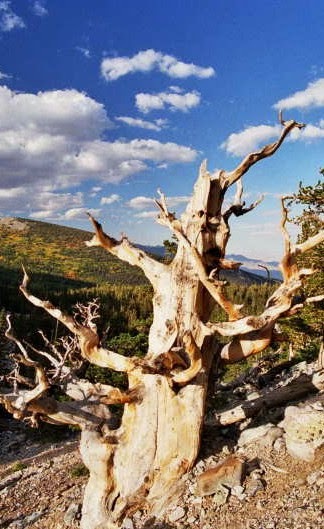 If humans lived as long as bristlecone pine trees, even 200 years would seem tragically short. If our average life span was that of mayflies, a few years would be a very long life. We also tend to perceive the present relative to the recent past [or at least our distorted perception of it]. We are happy when our situation improves and unhappy when it worsens. Otherwise, we perceive the present relative to [a somewhat idealized version of] what we think our lives could or should be like. Thus, we often are not content when our situation isn't improving. In mathematical terms, human happiness is closely associated with the first derivative (i.e., rate of change with time) of the "goodness" of our circumstances. We're happy when the derivative is positive (i.e., improving with time), sad or unhappy when it's negative, and discontented when it's near-zero. The Bible includes numerous examples of this concept, especially in the books of Exodus and Numbers. The derivative aspect of happiness explains a lot about life. It explains why drugs and other forms of instant gratification don't ultimately make us happy. It explains why people always try to acquire more money and more things despite having more than they'll ever need. It explains why it's so much more painful to have something and lose it than to have never had it. It might also explain the Bible's moral teachings, which generally encourage selfless and healthy behavior that isn't quite as enjoyable in the short-term as the things it discourages or forbids. And I believe it helps us better understand why a loving God would create a harsh, imperfect, broken world and ask us to fix it. It's natural to think a loving God should've made the world a happy, pain-free place where everyone lives at least 80 years. But such a utopia only seems good relative to our world. If the utopic world was the only one we ever experienced, it wouldn't necessarily seem any better because we'd perceive "good" and "bad" relative to that world. In mathematical terms, the value of C would be higher but dC/dt wouldn't be any different. We'd be like the Israelites after the Exodus, finding new [and more petty] things to be unhappy about. So why do bad things happen? If "bad" is indeed relative, bad things happen simply because good things happen. The only way to eliminate the "bad" is to eliminate the "good", which implies a constant C(t) that is the same for everyone. That would make dC/dt = 0, which, as the ancient Israelites can attest, seems quite attractive when dC/dt < 0 but not so much after you have it for a while. To be clear, I'm not saying God created the world to maximize human happiness in it. If that was his goal, he didn't do a very good job with it. But I think the nature of human happiness points us to something deeper. It suggests that a truly good world is one that is always improving. That's the kind of world the Bible promises, and I believe history shows that it's the kind of world we have. An improving world means there are things that need improving, which can be uncomfortable, painful, even horrific at times. It's also the kind of world that enables innovation, compassion, justice, forgiveness, mercy, hope, and perhaps even purpose. What is your purpose in life? And what would your purpose be if the world had no room to improve?